Ever since award-winning director and producer Timothy Hines premiered the Academy Award contender War of The Worlds: The True Story in 2012, we’ve been waiting for something equally riveting and elevating from him. Well, after three long years, the wait is finally over! Hines’ newest production, 10 Days in a Madhouse, hit the AMC Empire 25 Theater in New York City this Wednesday to much acclaim. Set for a nationwide release on November 20, the film, which is based on a book written by American newspaper reporter Elizabeth Cochrane Seaman (or as she was more commonly known: Nellie Bly), tells the story of Bly and her successful attempt at infiltrating an infamous women’s insane asylum in New York City. By pretending to be afflicted herself, Bly would spend 10 torturous days in the madhouse, before bringing the ugly truth of what went on behind closed doors to the forefront of newspaper pages. Playing the investigative journalist, who not only fought for women’s rights but saved thousands of lives through her craft, is actress Caroline Barry, for whom 10 Days in a Madhouse was her first feature-length role. According to a press release, Barry was chosen out of 8,000 hopefuls around the world for this role, and to be perfectly honest, it’s hard to imagine anyone else in it. Of course, we’re not the only ones to think so. “You also brought things that were unexpected — a depth of truth that was flawless. You were so truthful in your reading for the part that it was as if Nellie Bly was auditioning for the part of Nellie Bly,” Hines tells Barry in an exclusive GALO Magazine interview. Two weeks before the NYC premiere, Hines and Barry sat down together for an exclusive interview with GALO where they talked about capturing Bly’s character, her courageous undertaking and her undying desire for uncovering the truth. They also revealed how they navigated challenges on set and what behind-the-scenes surprises awaited them while working on the film. Timothy Hines: When an actor takes on the portrayal of a historical character such as Nellie Bly, there is a danger of projecting moments of greatness that historically we already know will occur. How did you navigate this challenge when filming 10 Days in a Madhouse? Caroline Barry: I think, at a certain point, acting is just convincing yourself of temporary amnesia. You have to convince yourself that you have no idea what will happen next or how it will end. In playing Nellie Bly, she goes into everything she does with such unquestionable confidence. Nellie already knew she would achieve great things, and if she were ever unsure, she would simply smile until everyone else was sure! However, I do think that, like all of us, Nellie had moments of private doubt, so I tried to find those moments throughout the script and throughout her life as I read more and more about her. I think in 10 Days in a Madhouse, you really get to peek behind the curtain into both sides of Nellie. TH: Nellie Bly’s real name was Elizabeth Jane Cochran. She used her pen name to fight injustice and expose corruption. How do you feel Elizabeth saw and incorporated “Nellie” into her own psyche, and how did you portray that on screen? CB: I guess you could say “Nellie Bly” was kind of her superhero name. With Nellie, she could have another identity separate from her own where she could be greater, wiser, more confident and brave than any other woman of her day, perhaps even more than herself as Elizabeth. Of course, I believe that Elizabeth would have been just as successful and groundbreaking had she not taken up a pen name, but I think with “Nellie Bly,” she realized that her writing could have so much more of an impact by creating Nellie into an undercover celebrity, a superhero. In 10 Days in a Madhouse, there were moments where Nellie puts on her cape, if we’re keeping with this superhero metaphor, and speaks up for the abused and does and says all of the things we like to imagine we would do in those circumstances. Then there are moments where she is alone in her tiny cell, listening to the sounds of the asylum, and it’s purely Elizabeth. However, my favorite moments in the movie were the moments where the persona of Nellie falters and you see Elizabeth behind-the-scenes, sorting through it all, trying to put the mask back on and save the day. TH: We had some intense shoot days where the difficult subject matter affected the whole cast and crew on set. How did you deal with this kind of heavy emotion — do you tend to divert to humor, internalize and intellectualize, or project your emotions openly toward others? Where does Nellie go during vulnerable moments, and how did you incorporate it into your performance? CB: I think I usually use humor to balance out that kind of intensity, but it was also important to me while filming to stay in the moment and let the emotional reality sink in. I realized while filming how much I had taken for granted the words “true story.” And then one day, we were filming a scene, and it really clicked for me that this story was absolutely real for these women and [the] thousands of other men and women who suffered in underfunded and corrupt mental institutions. I think you see that moment for Nellie Bly as well. Nellie also used humor throughout her experience to deal with the overwhelming circumstances, but then, ultimately, Nellie is profoundly changed by what she sees in the madhouse and her life is never the same. TH: What was your favorite behind-the-scenes moment on set? CB: I have so many! We shot most of the movie in a real insane asylum built in the late 1800s that had been abandoned for a number of years. We shot many, many late nights there, and there was a lot of the cast and crew trying to spook one another. One guy on our crew would always be popping out of dark corners. But then one day, I heard him coming down the stairs between scenes, and so I ran and hid by the steps. When he walked out, I just started walking really slowly behind him. When he felt the slightest something behind him, he dropped everything and ran all the way down the hall screaming. I never let him live that down! Caroline Barry: If you could spend an entire evening chatting with Nellie Bly over dinner and drinks, what would you ask her, and what would you tell her about yourself? Also, what do you think her drink of choice would be? Timothy Hines: I would ask Nellie if she believes in humanity. If she believes humanity is inherently good and needs a nudge in the right direction or if she believes humanity is fundamentally flawed and needs to be watched. There is no doubt Nellie respected her readers and saw them as having great power to makes change as a group. Clearly, she saw things that need to be repaired and corrected, and clearly, she went up against some very bad people. But I’m interested, at the core, how she saw the basic spirit of people. As to Nellie’s drink of choice, I don’t believe she was a teetotaler, but not much of a drinker either. As Nellie kept up with the times and was socially aware, I would say she probably would have tried the Champagne Cocktail that was very popular at the time. It was essentially some spices and a sugar cube dissolved into a glass of Champagne. CB: When you were casting for Nellie Bly, did you already know what you were looking for, or did my performance surprise you? TH: There were some basic things I was looking for in casting Nellie that I already had in mind. Her infectious smile, for instance — and you were one of the very few who auditioned who got this right. But you also brought things that were unexpected — a depth of truth that was flawless. You were so truthful in your reading for the part that it was as if Nellie Bly was auditioning for the part of Nellie Bly. [There were] many little things, some of which are intangible and others that can be pointed to. For instance, in your video audition, you made a mistake on a line reading and did not break character, but you recovered the moment, not only with poise, but very much how Nellie might have done it. You are a gifted and rare actress; one in a million. You have that unique combination of talent and charisma. It’s difficult to describe or pin down, but you know it when you see it. CB: What motivated you to tell the world about Nellie Bly’s journey into the madhouse, and how has her story impacted the way you see the world? TH: I wanted to tell Nellie’s story to inspire the world with a true story of how a woman with seemingly impossible odds could accomplish the impossible. This movie is about hope and is a sort of blueprint or how-to guide when facing a great challenge. I also wanted to help keep wedging the door open on women’s rights and how we treat our most vulnerable [individuals] in society. Plus, Nellie Bly was one of the most important Americans and she should not be forgotten. Everyone should know who Nellie was and what she did for the world through her fierce determination to not let the bad guys win. CB: What was your favorite behind-the-scenes moment from set? TH: Perhaps one of my favorite moments behind-the-scenes is when we were all working long hours one night in the main hall set at the actual asylum, when in waves, people began to play the period piano and sing along to various songs. The piano was old and very out of key, but as each person played a little piece and/or sang, it warmed the freezing surroundings and we all slipped into a holiday celebration feeling. I looked around at the happy faces working hard in difficult conditions and I felt a true sense of family with the cast and crew. 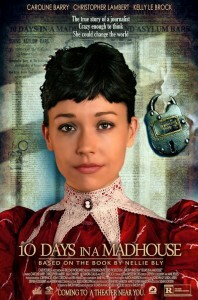 “10 Days in a Madhouse” is currently playing at the AMC Empire 25 theater, located at 234 West 42nd Street, New York, NY 10036. The film is set for a nationwide release on November 20. 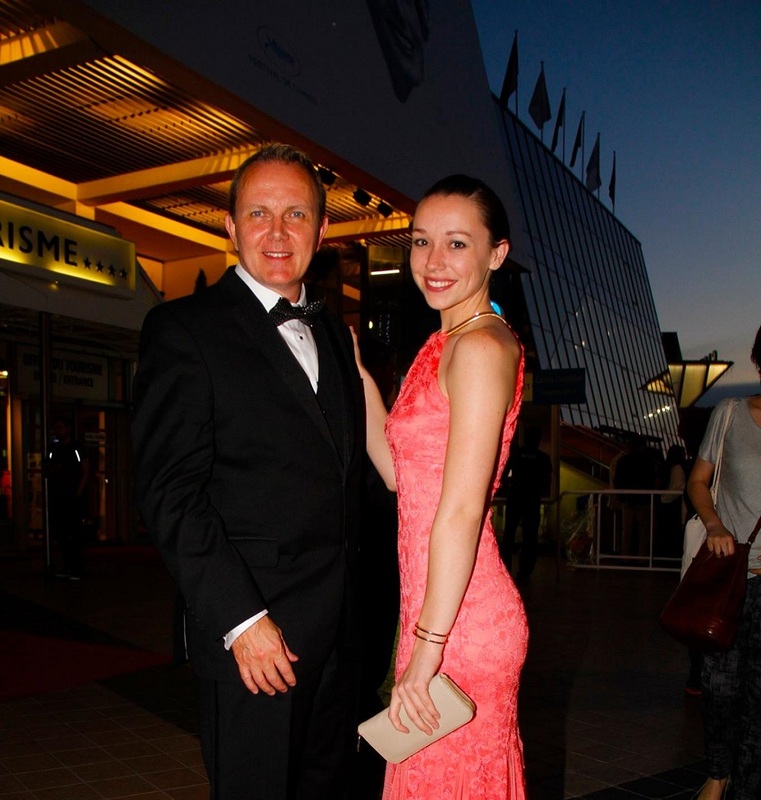 Want to know more about what Timothy Hines or Caroline Barry are up to? You can follow them both on Twitter: @CarolineB007 or @TimothyHines!